One of the great new features introduced in vSphere 5.1 was the ability to export and import the configuration of your vSphere Distributed Switch (VDS) and port groups to a file. This entry was posted in Network, vCenter and tagged PowerCLI, VMware, vSphere on March 29, 2013 by Alan Renouf. If you enjoy podcasts or have a long commute and don’t mind listening to people talk about PowerShell then I can highly recommend the PowerScripting Podcast, they have some great PowerShell information every week and if you have not listened before then you already have 219 podcasts to catch up on! Recently I had the pleasure of being interviewed on the PowerScripting Podcast by Hal and Jonathan, we talked about what was new with PowerCLI, what was cool in the world of PowerShell and also what I would do on a trip to Mars (I know – Random!). 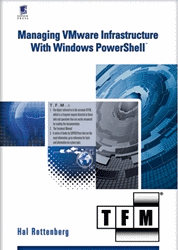 This entry was posted in General and tagged PowerCLI, PowerShell on March 22, 2013 by Alan Renouf.